TJ21 Media Group will capture your entire wedding experience, from the "save the date" video, all the way to the end of the reception. Most wedding videographers will only shoot the footage of the wedding and about two hours of the reception. But at TJ21 Media Group, we offer an entire wedding package that includes a special "save the date" video that is filmed and created months before the wedding, and for the actual wedding weekend itself, our crew is with you every step of the way from the moment you wake up all the way until nearly the end of the reception! Our wedding packages can be completely custom built to afford any budget. Basically, if you want your wedding captured, we will handle it for you and work with you on what you can afford. NEW! TJ21 can now offer an option of broadcasting your wedding LIVE along with the normal filming of your wedding! We can broadcast it on our Facebook page or even one of your own! Facebook only allows 720HD streaming (still awesome) but if you prefer 1080HD format, we can stream right to our YouTube page. This is perfect for those family members or friends who live too far and cannot make it to your actual wedding. We can even broadcast the live feed on a website where your information is listed, along with a "give a gift" button! People can give you a cash gift right from the website! Ask us how you can add this special feature to your wedding package today! With some of the latest in wedding day technology, we are now equipped, staffed and ready for your special day! 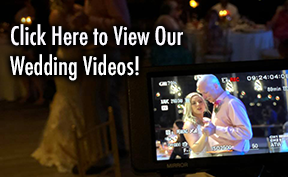 Take a look at the recent weddings we filmed and produced by clicking the link below.